The reason for using oil based inks is so that when I handpaint with traditional artist watercolours the oil based ink of the printed area repels the watercolour. If you were to use a waterbased ink (which dries quickly and cleans up with water) then when you come to handpaint it also dissolves the water based ink. Also you get such a lovely lustrous black with the oil based ink which highlights the colour of the transparent watercolour which I also like. I always start handcolouring by taking a less successful print (one with flaws such as overinking, underinking, missed patches etc) and use this as a ‘working handcolured proof. It is where I experiment with colours and make notes on the colours I have used. It is a working proof which means I record the colours used on the print (just by penciling them in on the border and sometimes painting a little square of colour) and note any changes I would make on the final editioned prints. That way I can remember what colours I have used, how I have mixed the colours & keep a record of the actual colour I used for matching later. 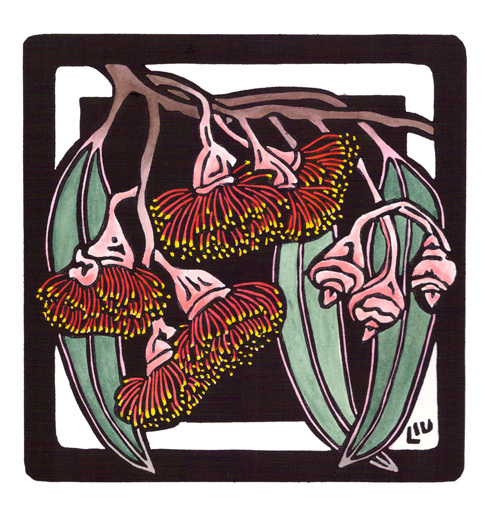 Handcolouring linocuts can mean a simple process of filling in the blanks with colour but for me it is a much more complex process. 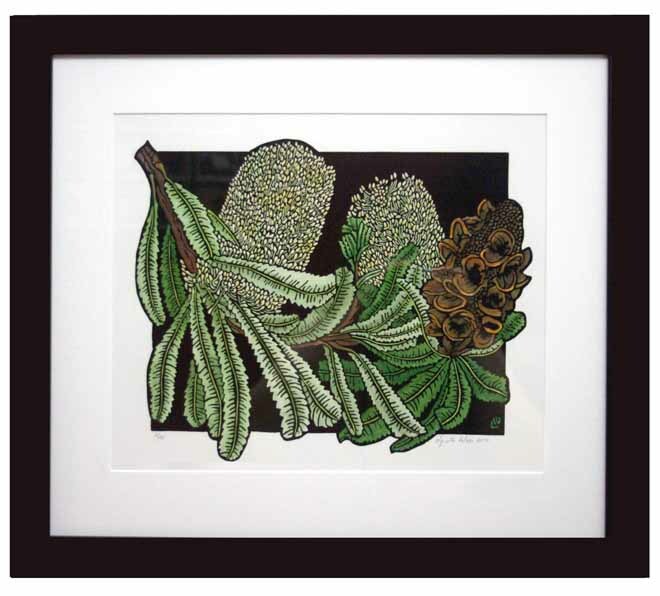 In this Banksia serrata design – Old Man Banksia – this design has a limited palette of creams/greens and a range of browns. 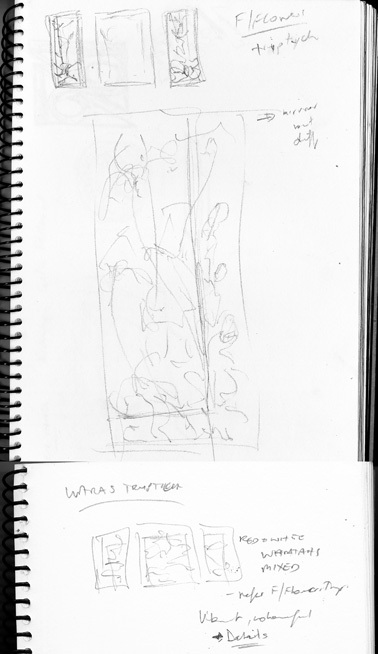 I am relying on tonal values as well as colour to build up the image, and some under painting of yellow & reds. 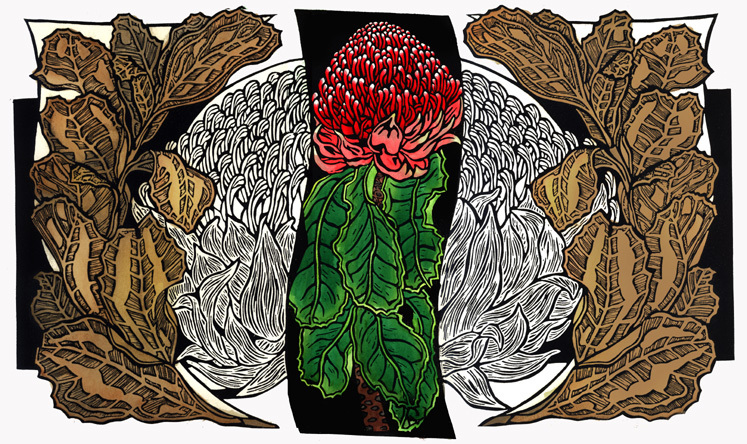 Below is the colour proof – the final colour of the seedpod for this design I have pared back to more brown & less red/yellow. 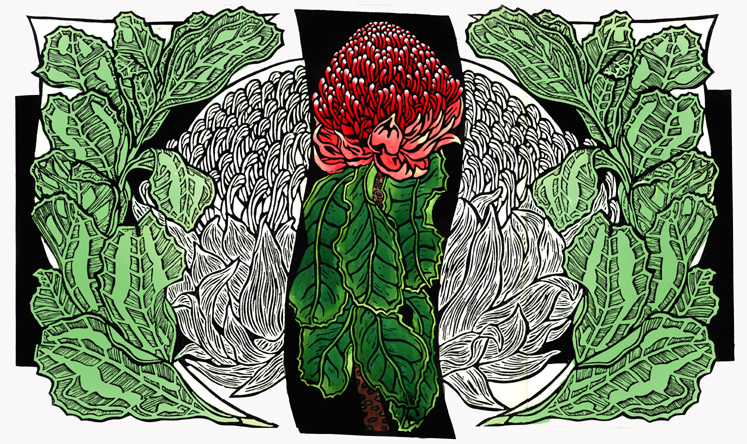 Laying down the watercolour for this design I have experimented, taken notes and referred back to the original plant, but tweaking the colour to what I want. And the final framed result. 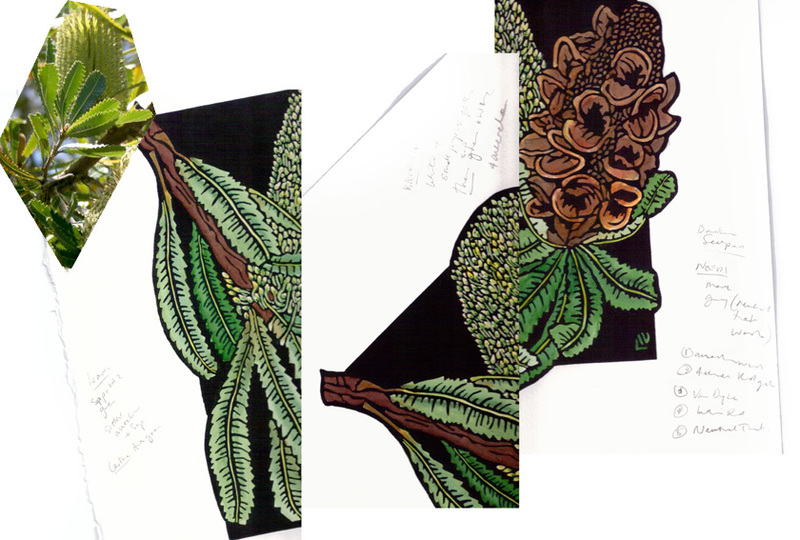 Four examples of original plant/image to final design after designing, carving, printing and finally handcolouring. 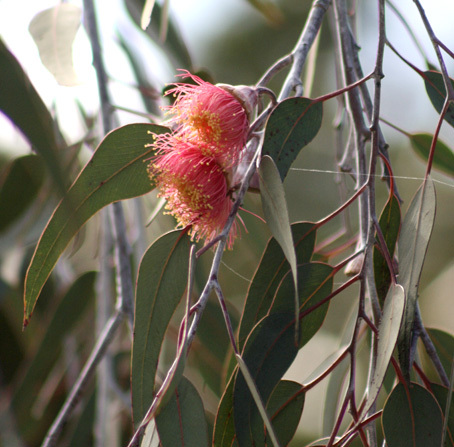 This first one is Eucalyptus caesia – also known as ‘Silver Princess’. 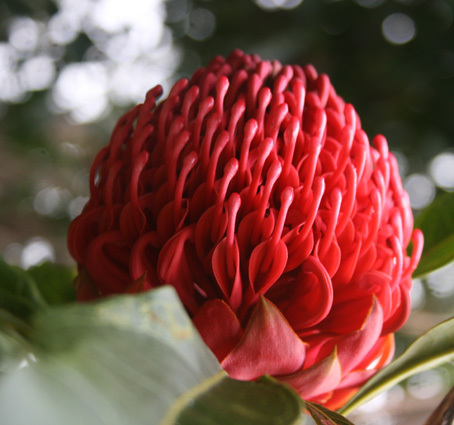 The second one is a Waratah – Telopea speciocissima. 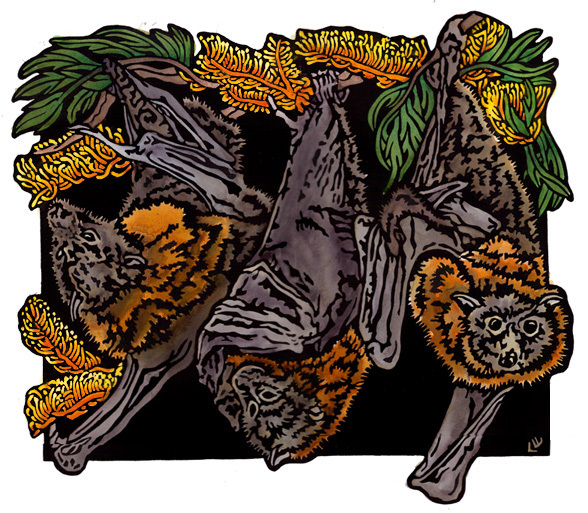 Finally some flying foxes – the Grey headed Flying Fox – in amongst some Grevillea robusta – I am looking forward to painting this one in particular. 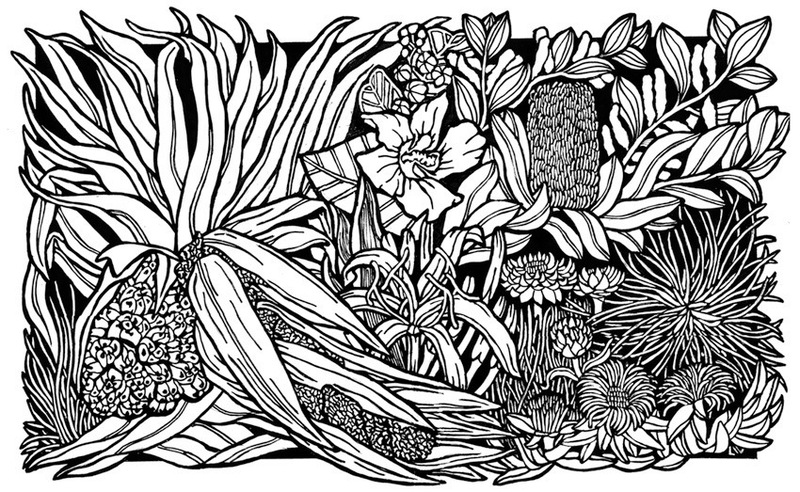 This design is quite complex to hand-colour – still not sure it is right. 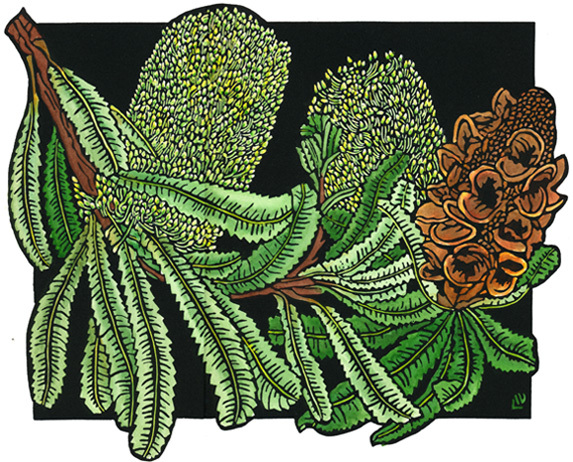 I am still struggling along with the final handcolouring of this print – like the image & colours but still trying to fiddle with some of the tonal variations and colour mixing in the print the image is getting a bit ‘lost’…so not quite finished. But in the case of this design I will put it away for a while and then come back to do the final handcolouring. 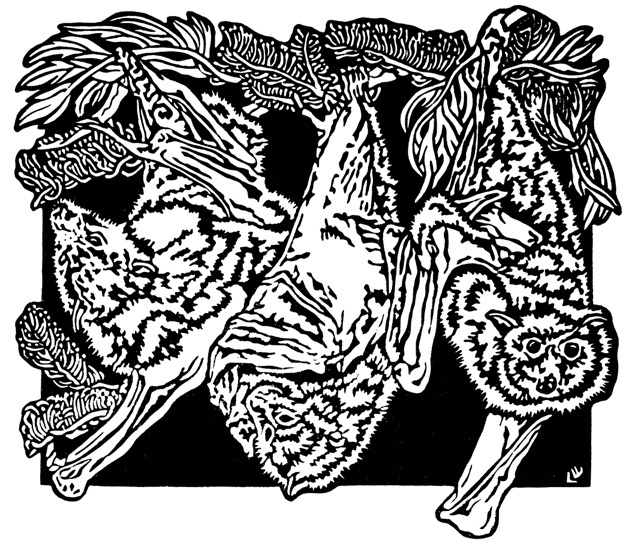 Once I have printed a number of ‘proofs’ or the whole edition with extras as ‘proofs’, I can then set about experimenting with handcolouring techniques and colours until I decide on the final result I want to achieve. Often I will do a number of different ideas and then leave them pinned to the wall for a while before making a final decision. For the ‘Regeneration’ design there were some major decisions to make with colour and not just blending colours. 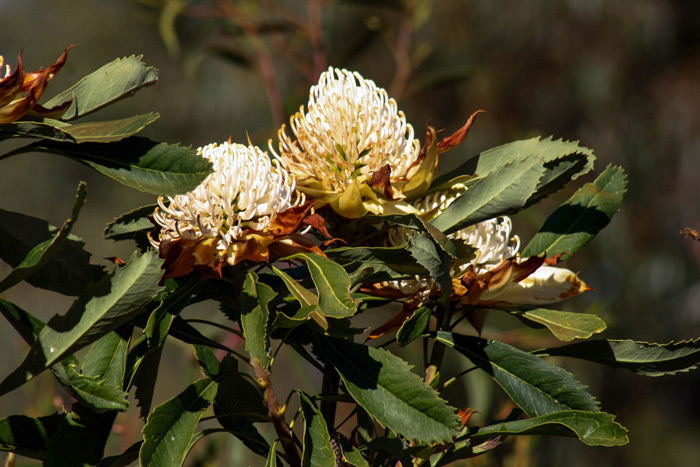 Here are 3 colour samples of this particular ‘Regeneration’ – waratahs design. 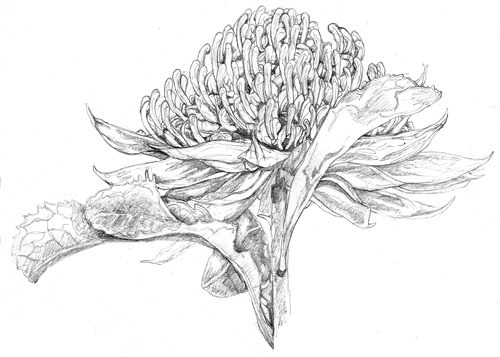 Waratahs Watercolour 3 – has pale sepia colours. 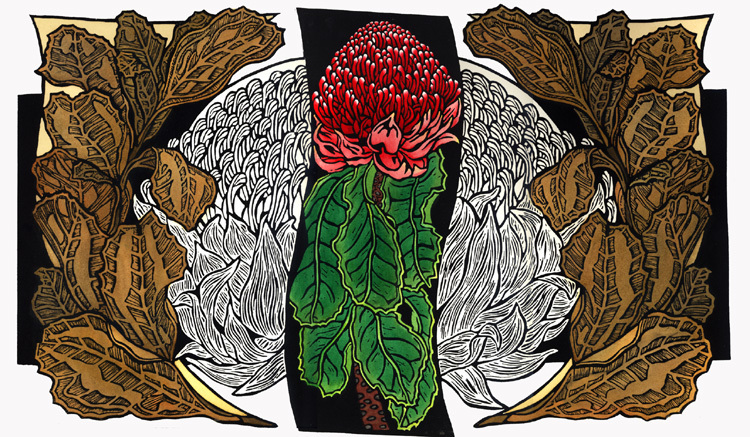 This is the completed handcoloured linocut – ‘Regeneration’ – Waratahs – linocut. 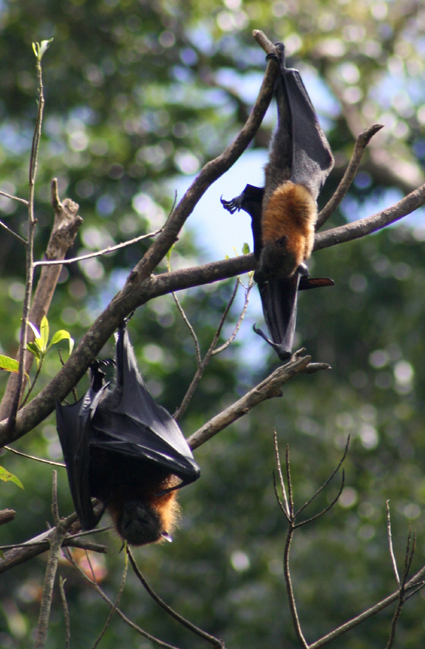 I have called it “Regeneration”. 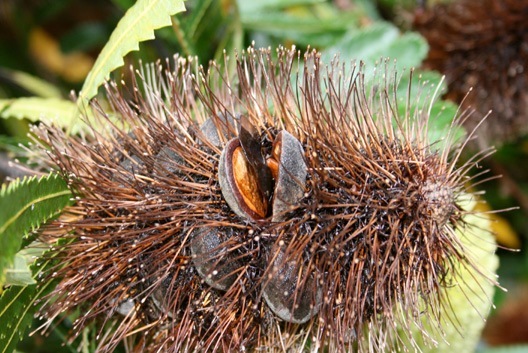 After the destruction that occurs in bushfires the waratah ‘regenerates’ from a ‘lignotuber’ which is a type of starchy or woody swelling found partly or fully on underground stems – like a life support system. 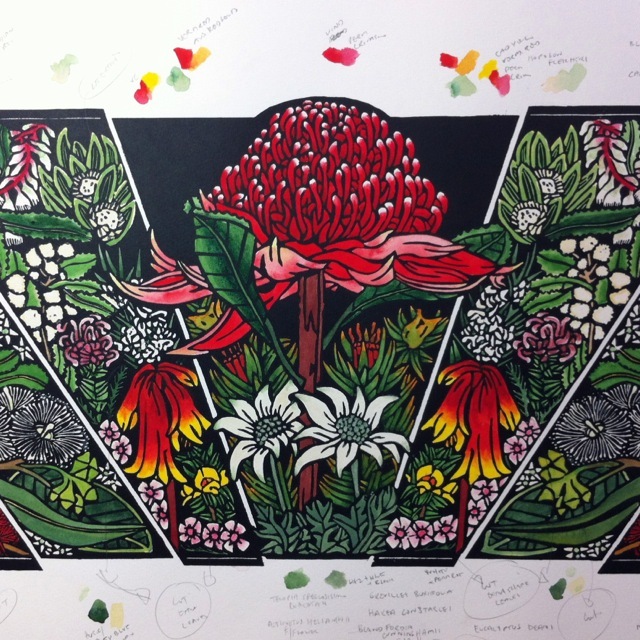 In this print the outside leaves that are destroyed regenerate into the magnificent waratah flowers of the central panel. 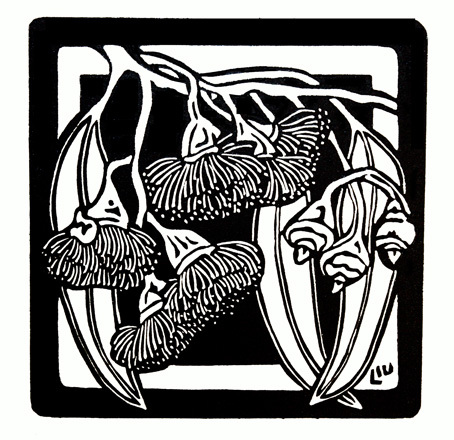 Thus after destruction and when there seems to be no hope of regeneration something found below the surface holds the key for rebirth. 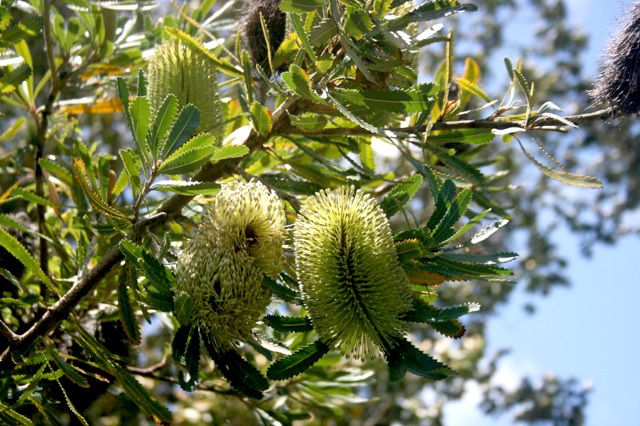 The final number for this Edition is only 5. This is a very small edition and reflects the amount of work within this design and as such the price will also be higher as only 5 plus 2 Artist Proofs will exist of this design. 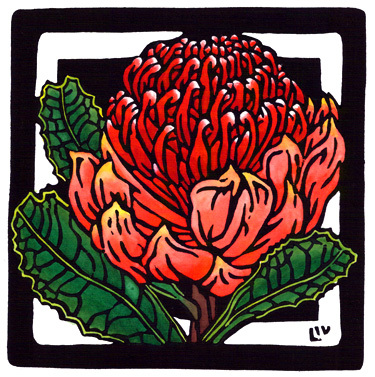 Having finally carved, printed and now coloured this linocut (after working on the original drawing over a year ago and the pre-sketch ideas over 2 years) I finally have finished! 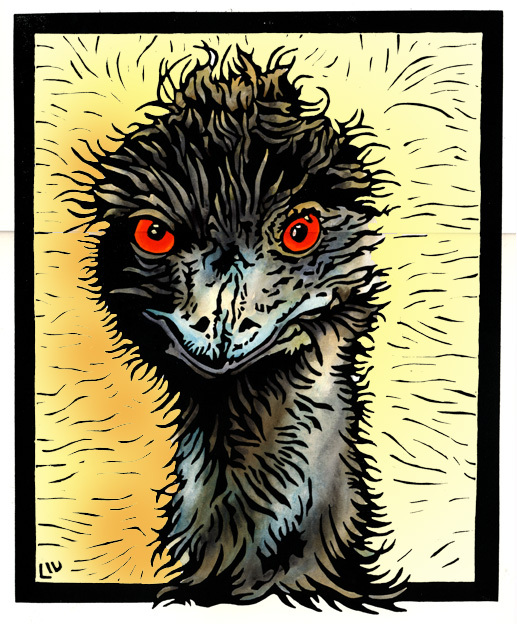 I had hand painted the emu above as you can see but it felt a bit empty so added a graded wash of ‘Australian Red Gold’ which I am quite pleased with. I must say this one of my favourite watercolour pigments as it just seems to have a glow about it. I think the background colour can make a huge difference to any work and often it may take several tries to create the effect you want. 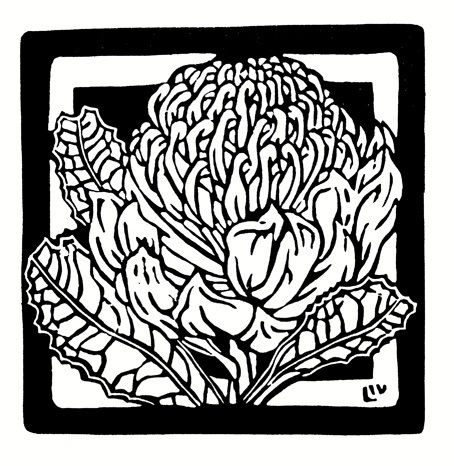 So now it is a matter of completing the edition of this design.